Why Get Married In South Africa? The weather is fantastic, the country’s infrastructure is excellent, the scenery is out of this world and the ‘backcountry’, or outback, areas in which to hike – the Cederberg, the Drakensberg, the Wild Coast, the Dolphin Coast, and Amatola (to name but a few) – are of the most beautiful on the planet. South Africa also has exceptional wilderness areas – areas dedicated to remaining truly wild spaces; intact and undisturbed by man – around the country that include: Hluhluwe-Imfolozi, Wolkberg, Winterhoek, Mkhomazi, Ntendeka, Groendal and the Cederberg. Each of these is ideal for days of off-the-beaten-track tramping specially for those for whom marked hiking trails are anathema. 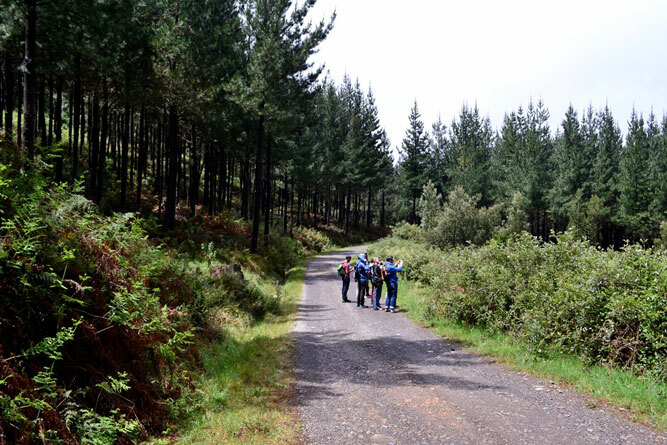 Our hikes, although well known amongst locals, have taken a while to draw the crowds. Now people travel specially to South Africa to join the Otter or Whale Trail, or to hike one of the Kruger Park’s Wilderness Trails. Here are the ‘Big Five’ multi-day hikes in South Africa that rank up there with the best in the world. This five day trail (75 km), or various versions on the theme depending on how much time you have to dedicate to the hike, explores the urban Table Mountain National Park in Cape Town. Best done guided, although there are route markers, the hike links two of the Cape’s icons – Cape Point and the city of Cape Town. Following a series of footpaths across the spine of Table Mountain and beyond, one overnights in beautifully designed tented camps (Oranjekloof is particularly beautiful) along the way. The route offers incredible views out over both False Bay and the Atlantic seaboard covering cliff paths, steep ascents and descents, beach walking and mountain paths. It takes its name from the Khoi name for Table Mountain (the mountain in the sea). The hike is strenuous though easily achieved if you are fit. Note: Hoerikwaggo Trail is temporarily closed as a result of the terrific fires that ravaged large parts of Table Mountain National Park in March 2015, although you can still do an adapted version of the hike. This five day, 43 km hike, from Storms River Mouth to Nature’s Valley in the Tsitsikamma National Park is the hike that placed South Africa on the international hiking map. It is also the oldest hiking in the country, introduced in 1968. 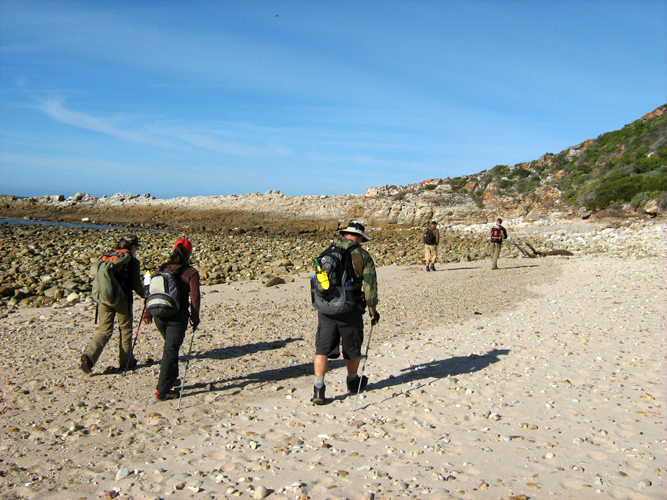 Named for the Cape clawless otter that occurs in the area, the trail covers some of the most scenic landscape of the Garden Route, never quite leaving the shore but following the cliff tops, climbing steeply more often than the average novice hiker would find comfortable, with resulting sharp descents. River crossings, particularly the Bloukrans River crossing, are tricky and best timed with low tide, and overnights are spent in comfortable huts usually on the shoreline, with incredible views. Those who have done the trail describe it as ‘paradise’ and its popularity (book at least 9 months in advance) is testimony to the fact (don’t forget drybags and a piece of rope to get your backpack across the rivers). 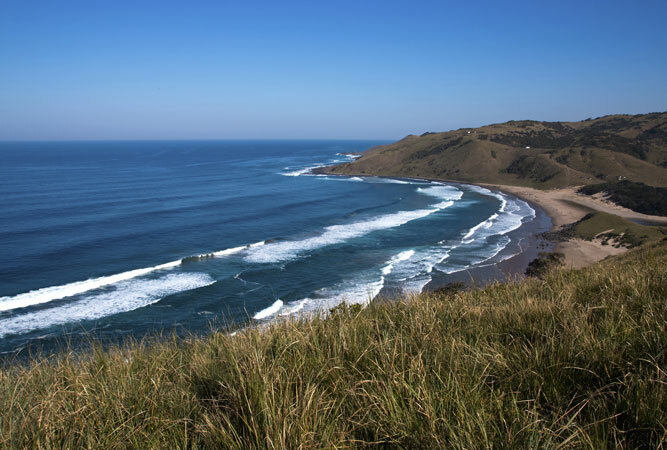 This fairly new hike explores the northern Pondoland section of the Wild Coast. Regarded as the least accessible, though also the most ruggedly beautiful, part of the West Coast this hike travels the section least explored (the Wild Coast’s other more popular trails explore the southerly reaches between Gonubie and Port St Johns). The Pondo-Explore trail takes place north of Port St Johns. This area is known as Pondoland; preserved as the Pondoland Marine Protected Area – the country’s largest marine reserve. These northerly reaches of the Wild Coast offer plunging waterfalls, kilometres of undisturbed beach, indigenous forests, cliffsides and only the tracks of wild cattle to disturb the landscape. The three to five day hike covers between 45 and 68 kilometres, overnighting in East African -style tents. There is the option of a guide, and porters. Africa Geographic touts this hike as, arguably, one of the world’s most extreme hiking experiences. Ridgeway Ramblers call it a ‘walk of no ordinary proportion’. 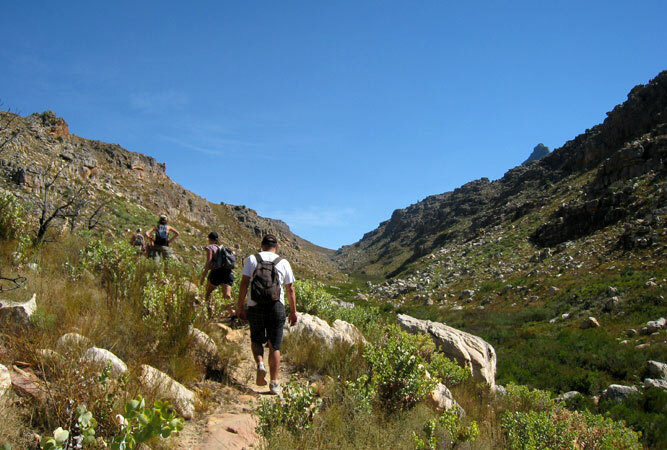 The mega-distance 650 km hiking trail that journeys through the Cape Mountains, between the Cederberg and the Outeniqua mountains, is the country’s longest mountain hiking trail. It takes 56 days to complete and links existing trails, through multiple CapeNature reserves and 180 private properties from George to Clanwilliam. Only a handful of people have completed the whole thing, and you don’t have to do it as one trail. Good beginner trails include the Cederberg Traverse, or even the Kouebokkeveld Traverse 2. 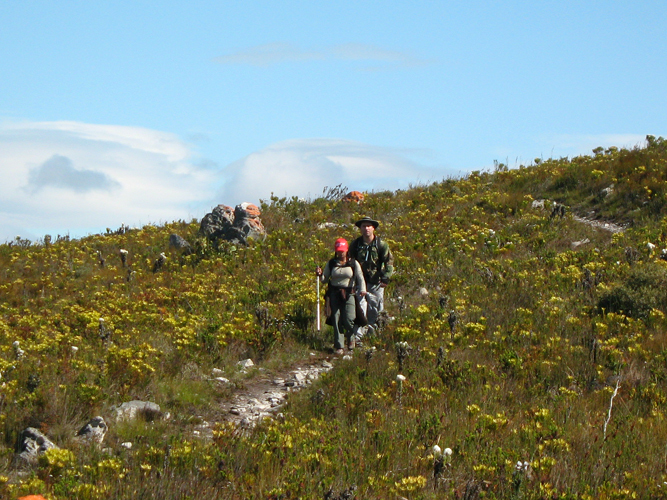 The first leg of the hike from Pakhuis Pass to Turret Peak in the Koue Bokkeveld has been open since 2010. You may lose your legs in the process, but you will find your soul in the mountains of South Africa. Probably one of South Africa’s most famous trails, the Whale Trail spans 54 kilometres done over five days on the Overberg coastline where the whales are at their best, between July and October. To get on the trail one has to book months in advance, even out of whale season. The beauty of the coastline in the heart of the Cape’s Floral Kingdom – its combination of mountain and beach walking in amongst fynbos, rock pools, ancient shell middens, cliffs, caves, calcrete cliffs, blow-holes, white beaches and the whales – makes it an unbeatable mix. Evenings are spent in well maintained huts in the De Hoop Nature Reserve, there is the option of having your backpacks carried for you (slackpacker), and after the hike there is the opportunity to visit the most southern tip of Africa – Cape Agulhas. SA-Venues.com © 1999-2018. All Rights Reserved. Find and book hotels and accommodation in South Africa.